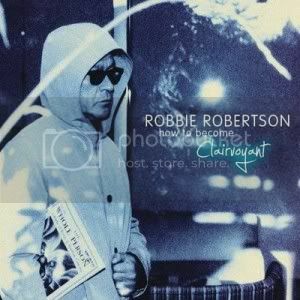 My ears perked up when I learned Robbie Robertson was finally releasing a new album and the title, How To Become Clairvoyant, also caught my attention. I pretended I wasn't going to buy it, having so many other albums to review and being short on cash. That lasted about a day. Resistance melted when I got bored and found myself wandering with a few bucks burning a hole in my pants. I can't tell you how many times I've listened to Clairvoyant over the past week but I haven't been able to shake it. I'll listen to something else for a while only to be drawn back to this. That pull began as an insistence I was going to write a review but I don't think that's what it is anymore. How To Become Clairvoyant is an amazing, versatile listening experience. Robertson is conversational and contemplative, telling good stories with plainspoken and poetic turns of phrase. He is thoughtful and philosophical, looking outward and inward for inspiration. It's a lot of ground to cover in 12 songs, especially with two instrumental tracks but Robertson does it and it all makes sense. The lyrics are often fascinating but they're only part of the stories. Robertson has teamed with Eric Clapton and Steve Winwood and the three legends have created a unifying sonic experience that creates a community for the lyrical ideas and for the past week, I've taken up residence. It's a moody, atmospheric, intellectual world where keyboards are used to create a cloudy drizzle that settles in like a stationary front. Robertson isn't a powerhouse singer, so this relaxed environment bathes his vocals in the proper ambience, freeing him to present the words without strain. Of all the guests – Robert Randolph and Trent Reznor also appear – Clapton is most present. He co-wrote several songs, shares lead vocals on "Fear Of Falling" while providing backing vocals on several others, and acts as assistant music director. His presence is a welcome one, never overshadowing or overpowering Robertson or the songs. "This Is Where I Get Off" and "When The Night Was Young" find him reflecting on his past personally and generationally. "This Is Where I Get Off" touches on his departure from The Band. He sounds like a man who carries the burden of regret but understands the right decision is rarely easy. He has also lived long enough and put enough time between himself and those times to see with the benefit of hindsight where he went wrong. It's an elegant, poignant song that attaches itself to a Robertson-specific event but resonates well beyond that. "When The Night Was Young" could be subtitled "Where Have All The Hippies Gone?" The Band was at the epicenter of the '60s revolution on their own and through their time with Dylan. They saw it all first hand. What is the legacy of that generation? Were they right or wrong? Did their ideals flourish or whither? "When The Night Was Young" also plays like a State Of The Union for the Baby Boomers because it does more than recount the history but also assesses the here and now for those who lived those turbulent times. "How To Become Clairvoyant" feels the most Dylan-esque to me, filled with poetic, literary phrasing. "She's Not Mine" is a heartbreaking ode to one who got away, made all the more touching by Clapton's great harmony vocal and some great organ work from Winwood. Robertson's love for the blues and its history is reflected in "Straight Down The Line" and "Axeman." How To Become Clairvoyant is a deep record that reveals itself over several listens and I'm not done with it yet. I choose not to believe it took Robertson a decade to ripen these songs for harvest, so let's hope this experience has inspired him to tend to his garden more frequently.